Name : Schiller 12- leads ECG (Swiss-made) with soft copy results at your finger tips. On many occasions, our patients come into the clinic complaining of palpitations, irregular heart beat with no chest pain that need immediate attention. We can perform a Twelve (12) lead ECG test immediately. Once the test is completed we can establish the next course of action to be taken (medication or transfer to hospital) for further case study by a cardiac specialist. 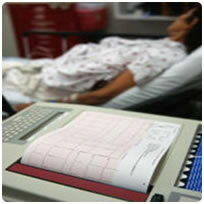 Resting ECG is also included in our annual medical checkup.